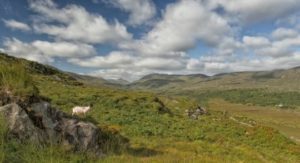 Moll’s Gap, located along the Ring of Kerry, offers an awesome, life-affirming view of the landscape and the Macgillycuddy Reeks mountain range. One of the most breathtaking places to see in Ireland, you should definitely stop for a photo on your trip around Ireland South! 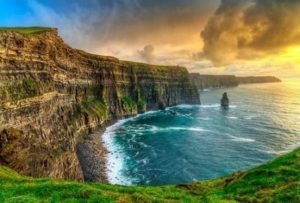 A bucket-list entry for many tourists, the Cliffs of Moher are one of the most famous places to see in Ireland. 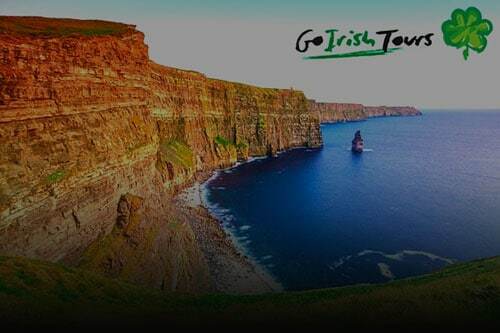 The breathtaking sheer drop of the cliffs into the Atlantic Ocean shouldn’t be missed by anyone travelling the Emerald Isle. Be sure to stop at the cliffs during a full circle of the island. The mythical Ring of Kerry is the crown jewel of places to see in Ireland. The breathtaking route snakes around Kerry’s coastline, through mountains, valleys and fields, giving an eagle-eye view of some really gorgeous countryside. If you’re passing through the West, it’s a must-see attraction and is great for driving at a relaxed pace. Dingle Peninsula resides on the west Atlantic coast of Ireland and is encircled by soft, sandy beaches and awesome juts of rock and cliff. If you’re interested in seeing the untouched beauty of the island, then the Peninsula should be added to your list of places to see. 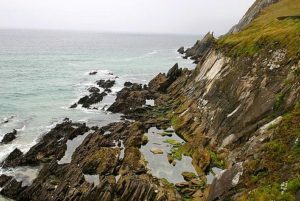 It’s a great romantic backdrop for a honeymoon, and you might even catch sight of a dolphin or two – they’re known to inhabit the coast of Dingle.